San Clemente’s internationally known Rainbow Sandals have supported a lot of feet in the last three decades, and now the tremendously successful company has extended its focus to support another form of locomotion. 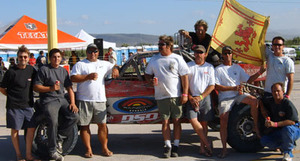 Jay “Sparky” Longley, Rainbow’s owner, is a primary sponsor of the off-road Baja racing team Highlander Racing. Composed primarily of firefighters, many of whom live in San Clemente, the Highlander Racing team also includes two professional mechanics, an aerospace engineer, an anesthesiologist and a bartender from a local tavern. “The bartender is not the anesthesiologist,” quipped Matt Drever, who co-founded Highlander Racing with Jim Vick in 1999. Baja racing began as a casual bet between two dirt bike enthusiasts in the late 1960s. The challenge was to see which of the two could get from the Post Office in Tijuana to the Post Office in La Paz faster. Since that first informal challenge, off-road racing has grown into a huge enterprise in which millions of dollars are spent every year in different classes of competition to answer the burning question: who can get from Point A to a faraway point B with the least damage in the shortest time? The top cars maintained by the most dedicated teams can cost a half million dollars each, and are followed by massive helicopter support, evoking visuals reminiscent of the movie Apocalypse Now. Highlander Racing competes in a Penhall Fabrication SCORE class 12. That’s the class for an open-suspension, tubular-chassis car with an engine displacement not to exceed 1850cc. Three major Baja races are involved: the 250, 500 and 1,000-mile competitions. The Baja 1000 is known as the “granddaddy of all off-road races” because it is the longest continuous off-road race in the world, meaning that racers do not stop between phases of the race…it’s a straight shot from start to finish. Other than fast-action pit stops similar to those seen at NASCAR races, teams race day through night, often 16 to 24 hours straight, depending on the type of vehicle. The Highlander Team focuses on the 500 and 1000 races. The Baja 1000 now attracts around 450 entries from 21 countries and is featured on ESPN and NBC. A good car and good drivers are a necessity, but it takes more than that to win in Baja. A diverse and dedicated support staff is in nonstop action behind the scenes during a race. Chase teams are in constant radio contact with the race car to inform them of their own position – and their competitors’. Support teams must leapfrog down the peninsula to stay ahead of the racers in case a pit stop is needed. Everyone wants a race to go flawlessly, but a troubleshooting team is a necessity if the inevitable problems arise. A major element of Baja racing is pre-running, or course reconnaissance. The course is open up to a month in advance so racers can familiarize themselves with problem areas and danger zones. Pre-running is a great way to psych oneself up for a race at the same time enjoying the warm hospitality of Baja California. Some of the Highlander Racing team members even have vacation homes south of Ensenada at La Bufadora, which serves as race headquarters during an event. As Baja racing grew from a hobbyist’s fascination into the professional endeavor it is now, expenses necessarily grew. The independently wealthy can maintain a highly specialized operation, and some teams even have huge automotive companies behind them, but a smaller group of garage-team enthusiasts needs not only their own support but contributing sponsors to keep them competitive. 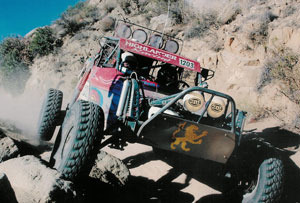 Over the years Highlander Racing has been helped by South Coast Distributing, Goody’s Tavern, The Rib Trader, Holley’s Tire, Dave Wert Auto, Shooters in Mission Viejo and the Cottage Restaurant in Laguna Beach. But what the team needed was a major sponsor – and that’s where Sparky Longley comes in. Virtually everyone on the Highlander team grew up wearing Rainbows on the beach in San Clemente. Longley was well known as an enthusiast for high-energy, high-adrenaline sports like surfing, hang-gliding, biking and snowboarding. Rainbow also produces a popular line of sheepskin footwear called “Baja Boots”. To the Highlander Racing Team, it looked like a natural match. The approach was successful.